Cathy has written this book in response to the many emails she receives from readers asking for help and advice with their writing. It is based on thirty years writing experience, which has included many international bestsellers, and up to date research. You’ll find lots of practical advice on writing and how to publish your work: everything the writer needs from composing that opening paragraph to seeing your book into print. "Clear, concise and packed full of practical tips." "About Writing is an invaluable guide for all aspiring writers... "
"Cathy guides you through the entire process, from composing your first paragraph to seeing your book in print. " "… a guide to creative writing that both published and non-published writers/authors alike will find useful. " "This book will prove to be a valuable aid to any would be author. Cathy's advice is really spot on, clear, concise and full of practical tips. " 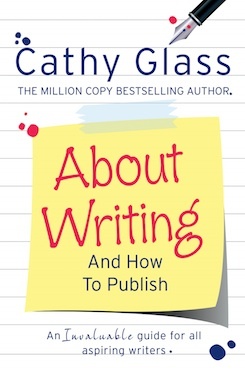 "Cathy Glass provides a clear and concise, practical guide on writing and the best ways to get published." "… I think it could teach some published writers a thing or two. " "... very insightful, structured and coherent. I like the short snappy chapters, that enable you to easily skim back and forth. There is plenty of useful advice, without being exhaustive. There are also helpful examples towards the end of the book."